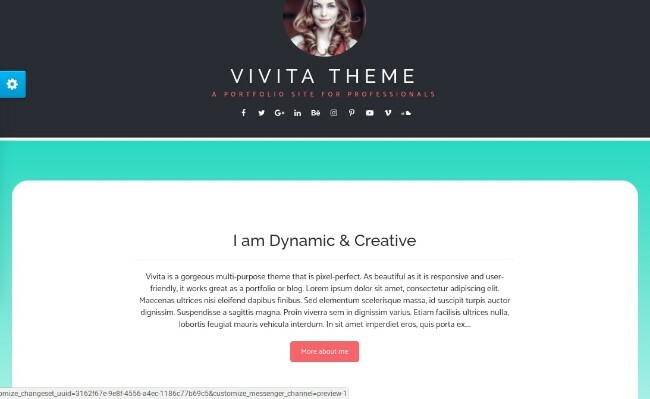 Vivita Pro includes an optional Promo / Bio section on the frontpage, which is ideal for an artist statement, mission statement, biography or candidate profile. You can enable or disable this section from the Customizer. To edit or disable this section, go to Appearance > Customize > Frontpage Content > Promo / Bio Section. The background colour for the Promo / Bio section is included in the preset colour templates that you can find in the customizer under Appearance > Colors. The fourth (last) color in the template is applied as the background for the Promo / Bio section.